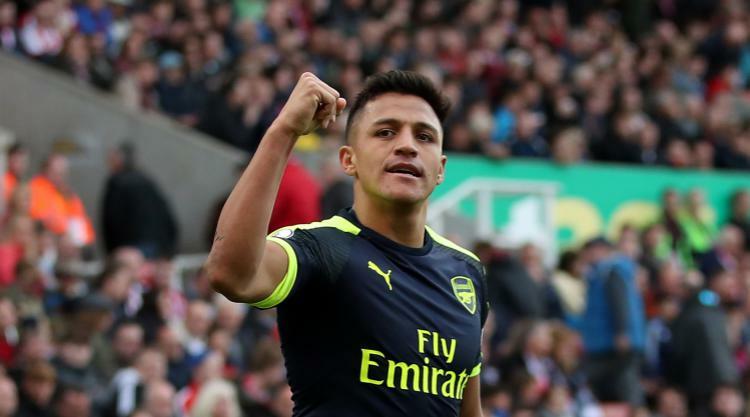 Alexis Sanchez hit a brace as Arsenal secured victory over relegated Sunderland in front of a sparsely populated Emirates Stadium to keep alive their dwindling hopes of Champions League qualification. The Gunners needed to beat David Moyes' men to take the battle to finish in the top four of the Premier League down to the last day of the campaign. They made heavy weather of their task, with Sanchez scoring a close-range double inside the final 17 minutes to secure the points with a 2-0 win. Under-fire Arsenal boss Arsene Wenger has never finished outside of the top four in a full season at the helm but despite this win, and even though it remains mathematically possible, the club look set for a Europa League campaign next year. Manchester City's victory over West Brom means Arsenal need to beat Everton on Sunday and hope Liverpool slip up at home to Middlesbrough to gate-crash the top four. Wenger's own position still remains a mystery as he has yet to announce if he will sign a new deal to remain at the club beyond the FA Cup final meeting with Chelsea in two weeks' time. A lot of the home fans who stayed away from this clash did so in protest against Wenger remaining in charge - those who opted to attend were left short-changed. Some supporters opted to stay away for other reasons but the official attendance of 59,510 was certainly wide of the mark, with Arsenal recording tickets sold rather than the figure who attended. Arsenal thought they were ahead early on but saw a goal correctly chalked off as a Sanchez shot hit Giroud on the arm as it flew past Jordan Pickford in the visitors' goal. Moments later the young Black Cats goalkeeper, who has been linked with a move to the Emirates, did well to keep out a genuine Giroud strike as the France striker found himself free in front of goal. Despite camping out in the Sunderland half, Wenger's side had few clear-cut chances after his early save from Giroud and it was his counterpart Petr Cech who had to dive low to stop Didier N'Gong scoring against the run of play. Hector Bellerin hit the side-netting after bursting into the box and the half ended with Pickford tipping an Aaron Ramsey strike behind. The second half began in farce for Arsenal as Nacho Monreal's overhit backpass was scrambled behind by a back-tracking Cech, resulting in an indirect free-kick for Sunderland. Shkodran Mustafi saw a header hacked off the line as Arsenal reached the hour-mark without breaking through, with Giroud glancing a header wide as the game wore on. Wenger threw on Danny Welbeck and Alex Iwobi but the former was again kept at bay by Pickford, who turned a low strike behind. Sanchez finally opened the scoring soon after, converting an easy chance from in front of goal as Ozil crossed from a pinpoint Xhaka pass. The Chilean had been on the periphery but hit the crossbar with a cheeky lobbed effort, with Pickford again on hand to deny Xhaka and Iwobi in spectacular fashion. Pickford was powerless to prevent Sanchez doubling the lead with nine minutes remaining, parrying Giroud's flick into the path of the former Barcelona man, who headed in to seal the victory. Mustafi had a late header brilliantly turned on to the bar by Pickford but Sanchez had once again provided the heroics to keep Arsenal's league campaign alive until the final day.